As a child, I treasured my grandmother’s chawan mushi, or savory Japanese custard with lots of goodies in it like shrimp, chicken and fish cake. Whenever she’d make it, I always asked for seconds so she started to make extra to anticipate my greedy request for more. The only thing that I didn’t find pleasurable when eating my chawan mushi was finding the one little yellow ginkgo seed (ぎんなん ginnan in Japanese) at the bottom. It was bitter and sort of squishy and the only thing it reminded me of was Chinese bitter melon (which I also didn’t like). 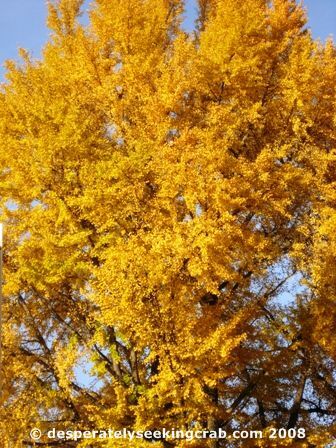 But as I grew older, I started to look forward to the ginkgo (often sold as “white nuts” in Chinese grocery stores in tins) at the bottom of the dish and even liked them skewered and sprinkled with salt on a stick at yakiniku restaurants. 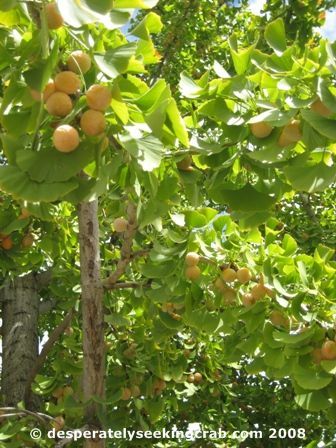 Ginkgo nuts are grown on beautiful trees that turn an amazing bright yellow in the autumn and brighten up the dullest rainy days. From the information I could find on Ginkgo trees, they have been around for over 200 million years and have done little evolutionary change during that time. 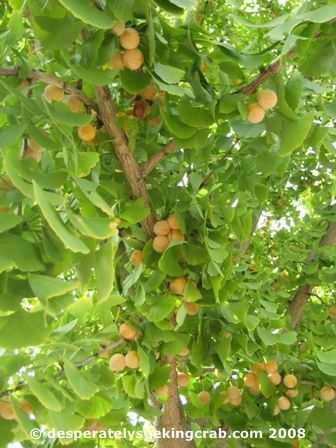 In western cultures, ginkgo biloba is created as a supplement (often in energy drinks) to aid memory – the plant definitely has been found to contain phytochemicals. 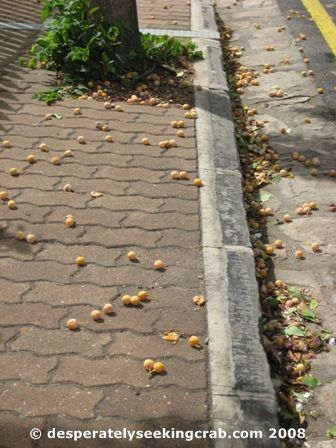 In all the years that I have seen ginkgo biloba trees, I have never seen it bearing fruit until about a month ago when I drove through a tiny lane in my neighborhood and saw a ginkgo tree (on the sidewalk) with a great big orange sticky mess under it. I immediately pulled over the car and ran towards it and realized that it was indeed ginkgo seeds! 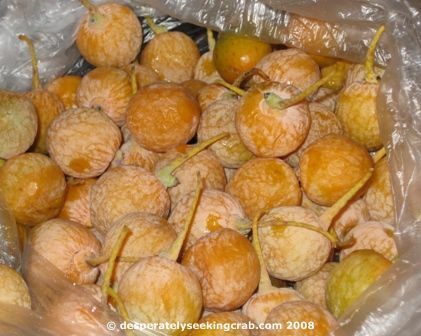 I was so excited that I crabbed a plastic bag from my car (I always carry them) and started to load up on these orange, wrinkly cherry-like seeds from the road. I honestly didn’t understand why I was so excited because I don’t even love them but I think just the novelty of them made me giddy. Actually, I felt a little sorry for the people who owned the house in front of the tree because it was making a huge mess everywhere and it spilled onto the tarmac as well. I can tell from the mess around the tree that no one was picking these or cared to – probably because of their smell or because their use is not common in western cuisine. My mom takes the fuit (or seed?) out of the shell and toss it around on a oiled pan w/ little bit of salt. We eat them as snack. In Japan, I’ve had them roasted over the fire and eat them w/ my sake. I love ginkos but I do agree that the fresh ginkos on the street have a very pungent smell.